Fishers Island Oyster Farm has been family-owned and operated by the Malinowski family since 1981. Fishers Island Oyster Farm is a small, family-run farm founded in 1981 by Sarah and Steve Malinowski. We got our start during a time when only a few people were exploring the possibilities of modern aquaculture, and it took a lot of determination, collaboration, and a few serendipitous accidents for us to arrive at where we are now. Anyone who farms oysters for a living will tell you that it is as much a lifestyle choice as it is a business. We wanted to build our lives, and our family around the idea of working with nature, and it turned out that oyster farming offered this to us and much more. We moved to Fishers Island during the fall of 1978 because there was a cottage we could live in for free. We worked for the local marina and started thinking about what we could do to support ourselves. In 1979 Steve embarked on a PhD program in Marine Ecology at the University of Connecticut as we both continued working at the marina. Steve studied the ecology of hard clams (Mercenaria mercenaria) in Eastern Long Island Sound and became earnestly enthusiastic about aquaculture. Kate was born and went to work with me at the marina. 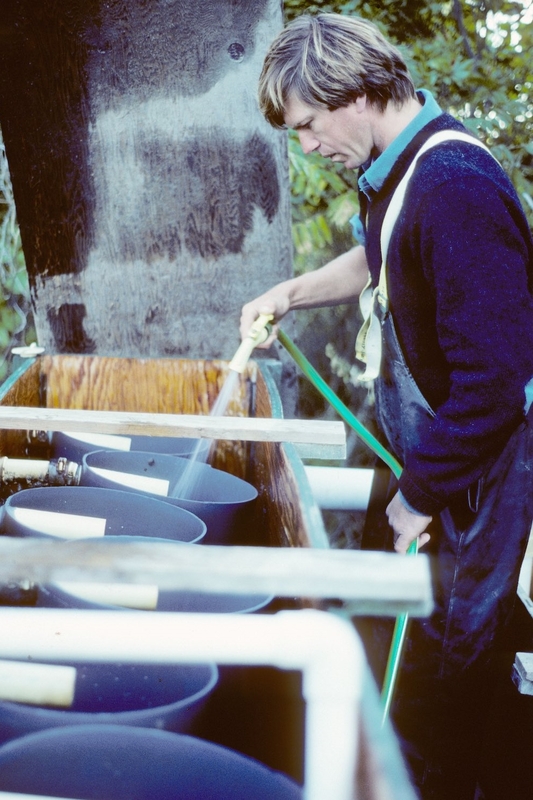 Steve began applying for grants and put together a business proposal for starting the Clam Farm, which was incorporated in 1981. Nick came along and I stopped working at the marina. Steve embarked on various grant-supported research projects having to do with clams, and luckily these put food on the table. Pete was born in 1983 and Molly in 1984. In the mid-80s brown tide, a dense bloom of phytoplankton, decimated the Peconic Bay scallop industry. This tragedy created an opportunity for us. For a number of years, we collaborated with Long Island Baymen, NYS DEC and Cornell Cooperative Extension and grew seed scallops in pearl nets on Fishers Island to restock scallops into Peconic Bay. We had the good fortune to get to know several Baymen and learn about their industry first hand. Our interest in ecosystem restoration developed during this era. Meanwhile, the hatchery where we were obtaining scallop seed accidently mixed some oyster seed into a delivery. Thus, we serendipitously began to grow oysters! The oysters grew beautifully in the pearl nets. Our first oyster harvest was 1987 and we were able to sell marketable oysters to the Old Lyme Inn and several other local restaurants. After struggling for seven years to grow clams at a site that just was not conducive to this effort, we gave up and started growing oysters in earnest. The following year we had enough oysters to venture into New York City. This was before the era of celebrity chefs; in the fall of 1988 Steve just called Jean-Georges and made an appointment. That year we sold oysters to Vongerichten at Lafayette, Waldy Malouf at Hudson River Club, Charlie Palmer at Aureole, Rick Moonan at Water Club and Mike Lomonaco at “21.” These chefs were our age and starting to make a name for themselves. In the early 90s selling farm raised oysters was easy; they were a novelty. Blue Point oysters were the most numerous offering, but by this time it did not have much distinction, because almost every northern oyster that found its way to a menu was called a Blue Point. Chefs were delighted with our distinctive petite farm raised oysters and loved the farm-to-table aspect of our business, which we continue to this day. We collaborated with Carey Matthiessen for our seed oysters until we started our own hatchery in 1995. Our seed production now accounts for half of our business. Many oysters that appear at raw bars and restaurants with names like Cuttyhunks, Montauk Pearls, Ninigret Cups, and some Wellfleets started life as a Fishers Island Oyster seed. Like all farming there are no clear lines between farm work and family life, and this worked out well for us. Our children have all worked on the farm with us and experienced first-hand the good years and the bad years. Problem solving was dinner table fare and surviving failures and disappointments became part of their lives and has served them well as they have embarked on their livelihoods. When our kids were not helping us on the farm, they knew their other job was to work hard in school. Sarah spent eleven years on the school board and we pushed for higher standards for all island children. Our educational interests were further broadened by our relationships with chefs and restaurants. Before the internet, our interactions with them served as an important link to the outside world, and particularly in the five boroughs of New York City. The tragic events of September 11, 2001 changed our outlook on the world. Fishers Island Oysters made the transition from 21 Club to Windows on the World with Mike Lomonaco and Windows became our largest account. Our loss (a few hundred oysters) on 9/11 was insignificant, but the ensuing political shifts created a watershed moment for us. When France did not support our invasion into Iraq in 2003 there was a backlash against several of the French restaurants in NYC where we sold oysters. These events engaged our hearts and changed our attitudes. We began to ask ourselves more often: what is important about what we are doing? How can we be part of the larger world? The answer was James, and of course, oysters. James had been visiting us in the summers through the Fresh Air Fund when he recognized, as a sixth grader, that he needed a better environment if he was going to get through school. When Sofie left for college, James took her place at the table. The entire Fishers Island community joined the effort of catching James up academically. He has been keeping it real for this island and family ever since and is now, we are all proud to say, a sophomore in college. Helping James reach his goals is the most important thing we have ever done. Through that work we came to know the great obstacles many New York City kids have to overcome in order to get an education, and we were given an unique opportunity to help through the New York Harbor School. The Urban Assembly New York Harbor School is a sanctuary for teenagers. As part of their curriculum, the high school students and teachers get to connect to their marine environment via the oyster. They are doing real environmental work that will result in New York Harbor once again being a place where wild oysters can thrive. It is thrilling to know these teachers and students; their dedication is awe-inspiring. Our relationship with Carey Matthiessen over the years has been the great good fortune of settling on Fishers Island. Carey is to the Oyster Industry what his brother Peter was to the literary world. Both of them: lifelong activist naturalists and eager to mentor the next generation. Carey is everything we want to be: fair-minded, thoughtful, generous, a great Dad and husband, counselor and a very fine oysterman. First there were Blue Points, then there were Cotuits, and then the rest of us came along; always building on the hard work and innovations of those who came before. Carey had been growing oyster seed on Fishers Island since 1962 for his Cotuit Oyster Company on Cape Cod. We admired Carey and thought we could do something similar. We learned a lot about spawning bivalves for seed production from Carey. Carey and Steve are both doers more than talkers, yet my favorite image of them is when they were standing still talking, which for many years was pretty often. Carey - hands in pockets, Steve –arms folded over his chest usually wrestling over a snarly bivalve problem and occasionally a joint fuming about Nixon. During our early years, our enthusiasm for aquaculture was bolstered and continues to be bolstered by other dreamers who came to work with Carey at Ocean Pond. Many a beery evening was spent (and continue to be spent when possible) with Joth Davis (former President of National Shellfish Association and owner of Baywater Sweets), Seth Garfield (Northeast Maritime Institute Aquaculture Program Coordinator, and owner of Cuttyhunk Shellfish Farms Inc.) and Bob Rheault (former owner of Moonstone Oyster Co. and now Executive Director East Coast Shellfish Growers Association). Carey and his wife Cis nurtured all of us with good food and great ideas. They encouraged and mentored our work. We would not have gotten this far without them. Carey and Cis now reside in Chester, Connecticut.